You are currently browsing the Christian Heilmann blog archives for September, 2008. Dedication is a really nice thing. Esteemed Yahoo colleagues Stoyan Stefanov and Nicole Sullivan of the exceptional performance team are two people who are dedicated to making the web a faster place. You can upload a bunch of images, give it a URL or use it as a Firefox extension or bookmarklet. 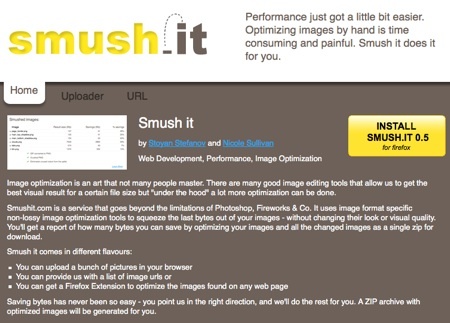 Smushit will show you how many bytes you can save by removing cruft from the images and gives you all the images as a zip file to replace them on your site. How cool and easy is that? I use twitter a lot. Some of what I write is very relevant to the blog here, some is not fit for publication and some is just personal. So publishing all the tweets here would have been disruptive, hence I tried to find a way to filter things down. What I do is that I end every tweet that I want to show up here with a § symbol, thus giving me a handle to filter out the good ones. As twitter is probably the most hit API out there I didn’t want to go through the API and all the authentication malarkey. Instead I am using the ATOM feed and pipes to get the information and to filter it down. It takes the atom feed of a twitter user of a certain ID, removes all tweets but the ones ending in a § and removes the user name of the output. 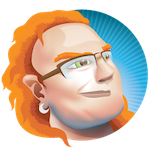 The tweet() method checks if data was retrieved, creates a list of links and appends it to the DIV. Hope this is useful to someone else, too. I am now a proud user of a 24 inch monitor at work and I realized that when I read large texts, the amount of white on the screen starts to hurt my eyes. 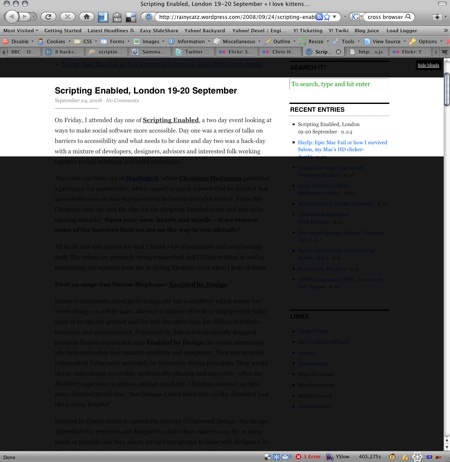 Therefore I’ve written a small bookmarklet to black out part of the screen on demand and have a link top left to show and hide the blinds that cover the rest of the content. The blinds are fixed position so that I can scroll the content behind them. 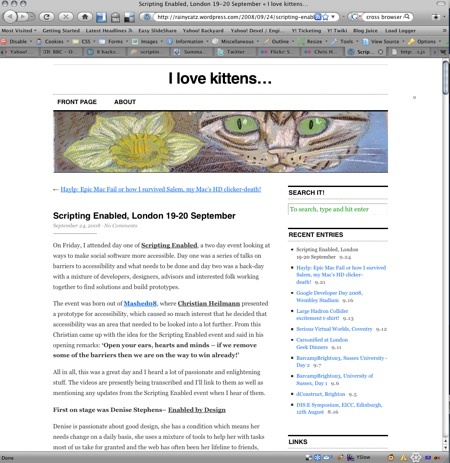 I also add padding to the bottom of the document to have enough scrolling space.